Sara R. Bass dives into the work of Chelsea Revelle and Kathline Carr. Last chance to see this show! Mostly when an audience is encouraged to “look beneath the surface” of a piece of artwork, the assumption is the plot or materials structuring its body will lend themselves directly to the themes the artist intends. Chelsea Revelle and Kathline Carr interpret “Beyond the Surface” in a different way, creating media that disassemble the surface-level narrative and prompt a curiosity about what is lacking. Revelle then makes memorabilia of peeling wallpaper, cracking paint, and embroidery to explore the historical entrapment of women by domesticity and its lingering residue in modern culture. Alongside such assemblages are Carr’s prints and paintings that draw on the human relationship with nature in both a generally adverse way and a personally teaching way. One of the collections that easily caught my attention is Revelle’s Memory Series. 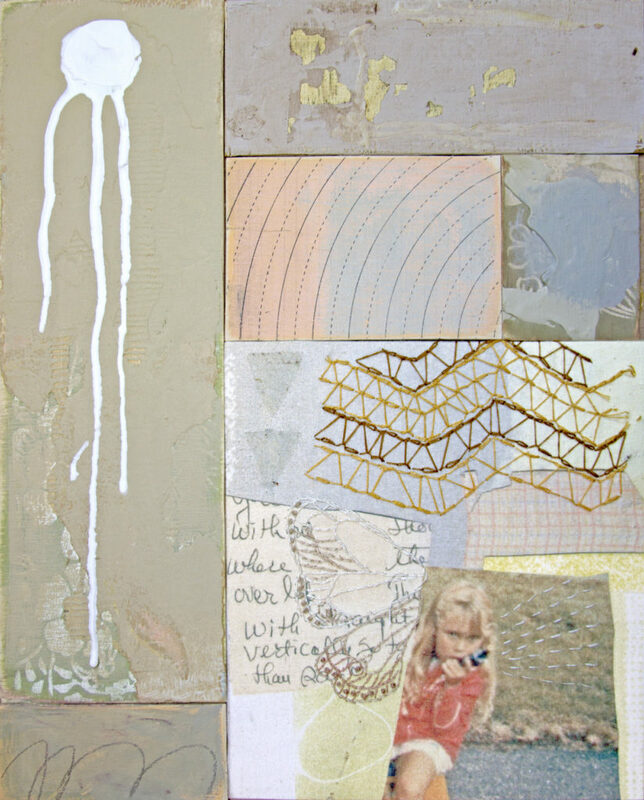 Each framed piece of mixed media is named after a street from her childhood and features a texture representative of a beloved memory associated with it. The furtive inclusion of a snake symbolic of her feral pet in Daily or of a wing symbolic of the tooth fairy that helped cultivate the tender relationship between her and her cousin in Jerrold, for example, create central moments around which more memories can collect. The series captures one facet of domesticity dampening women’s human value because it reverses the narrative of young girls building with dollhouses fantasies of their futures that directly reflect the confined role society expects from them. Through assembling found material and imbuing new life into pieces of a real house these girls imagined their later selves to care for, she tells the story instead of her childhood, the aspects that made her genuine rather than mechanical. Again, in her Hidden Mother Series, Revelle cleverly emphasizes what is not present. She brings to the forefront the bones of a household, obscuring the mother behind beams or muddles her portrait with textures characteristic of a home. Simultaneously, she creates a segment of a home that stands as her canvas of pieces of suspended furniture. Similar to the those chairs and drawers within her sculptures, she removes their bases, forcing them to find stability dependent on a new foundation. Within these pieces, Revelle poses the question of what a mother’s purpose may be in the absence of a child and in a society that equates her value with her ability to manage a household. Carr’s work too is a chronicle of her experiences. 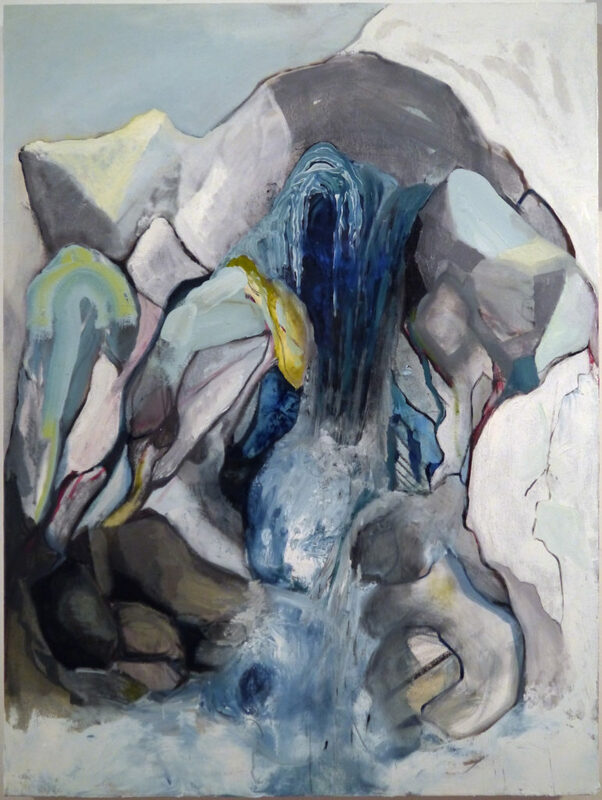 Her paintings embellish or distort pieces of the environment she photographs on the frequent walks she takes outside, so she maps her stream of consciousness onto a physical form. This process, she says, provides her a moment on which to hang a longer string of memories. Another characteristic aspect of her work is its platform to ponder the relationship between humans and the environment. Some of her painting, strangely, are even reminiscent of body parts leaving an ominous feeling of the threat from monstrous power. Climbing the Fracture Zone for example struck me as two grabbing fists below a dark, malicious head. Serac looked like a glaring eye. 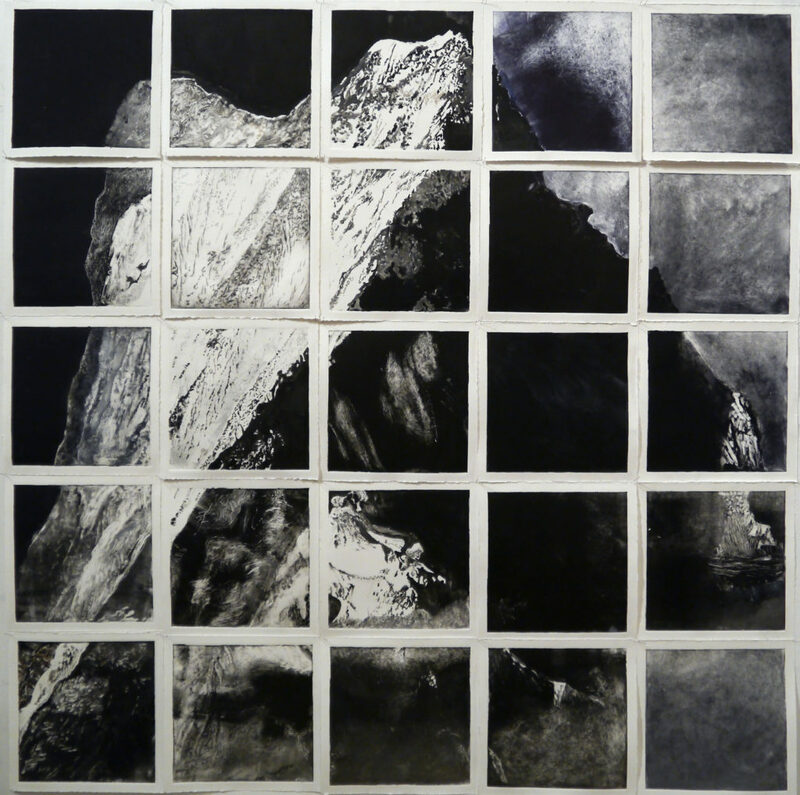 She additionally powerfully represents the theme of “Beyond the Surface” in her striking monotype installation – Mountain 25 Views. 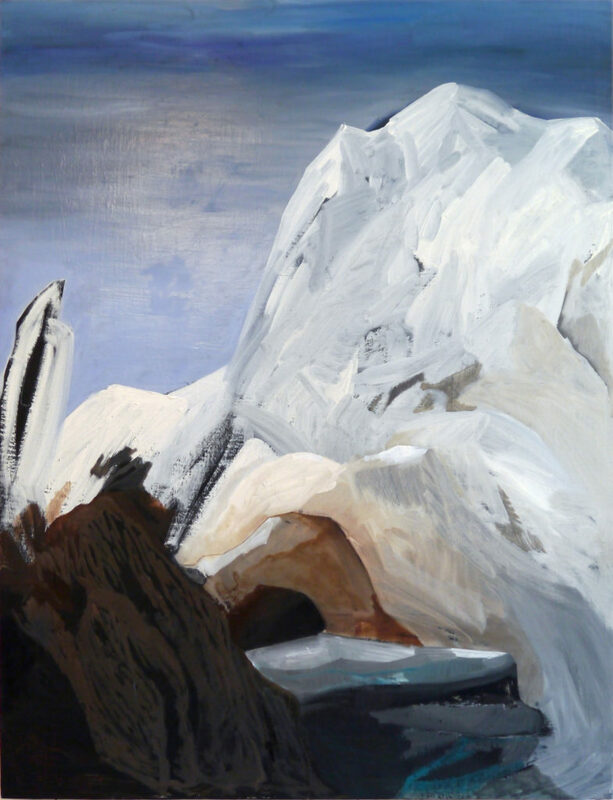 She describes each print as a puzzle piece which when piecing together she learned a new appreciation for Machapuchare, a Himalayan mountain untouched by humans. Through manipulating its prints, though, she creates a more beautiful and constructive relationship with nature that shows human interaction can produce a more hopeful result. Change doesn’t necessarily happen only superficially. 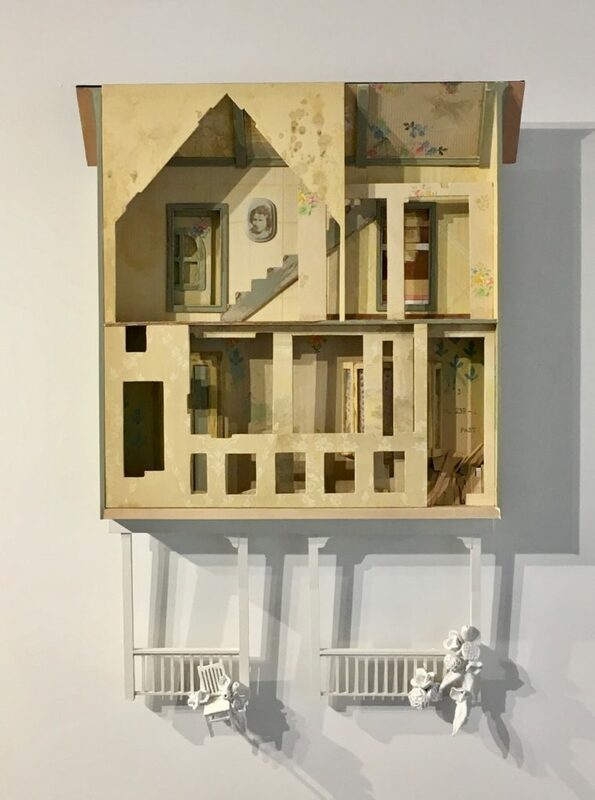 Though seemingly distinct processes, both artists use the artifacts shown in their pieces as sorts of hooks on which to hang pieces of a more elaborate narrative also associated with that street, clip of childhood, trail, and memory. Exploration doesn’t just spread across the surfaces of these artists’ pieces but penetrates beneath where the plain wonders what more is being left unsaid. Both artists do an effective job of conveying the unseen by surfacing possibility for the audience to then run with in their own directions.